Probably the finest Shorter Blue Note album, apart from all the others. (Later in the post, you will see I’ve popped in a Shorter favourites poll). The cover of Schizophrenia shows solarised mirror images of Shorter, symbolic of the schizophrenia beloved of ’60s popular psychology and Alfred Hitchcock movies . How’s your mum, Norman? Warming to the split personality theme, I have two copies of Schizophrenia, both stereo naturally, begging for a shoot out: an original copy on Liberty, and the last gasp of Blue Note on vinyl, a Connoisseur from around 1995, over two decades apart. Curtis Fuller (trombone) James Spaulding (alto sax, flute) Wayne Shorter (tenor sax) Herbie Hancock (piano) Ron Carter (bass) Joe Chambers (drums) recorded Rudy Van Gelder Studio, Englewood Cliffs, NJ, March 10, 1967, released it seems later, in 1969, by Liberty Records Inc.
A Shorter sextet tour de force, rich in harmonies from the combination of alto/flute, tenor and trombone, blistering forward propulsion from Joe Chambers. Hancock scampers all over the keyboard, picking up motifs and echoing fragments, dancing around the other players, while Carter weaves his masterful roving walking patterns. Shorter’s pungent tone and energetic angular runs are busier here than on some of his other more stripped down work. The selection tune Tom Thumb combines sassy brass heads with undertow of boogaloo swing, infused with sweet and sour solos, a juggernaut of modern post-bop-funk. I don’t think you find this delicious conflation in many places, which owes a lot to the unexpectedly spicy inclusion of Curtis Fuller and James Spaulding. While you are hanging on to the individual pyrotechnics and interactive dynamics, Schizophrenia has strong compositions which burrow their way into your consciousness. Each tune has its own mood, and complement each other into a very satisfying and cohesive album, Shorter at the peak of his powers, battle-hardened from two years working with Miles Davis, and telepathic communication with his other players. An album that repays repeated listening. As it happens, it’s my favourite. 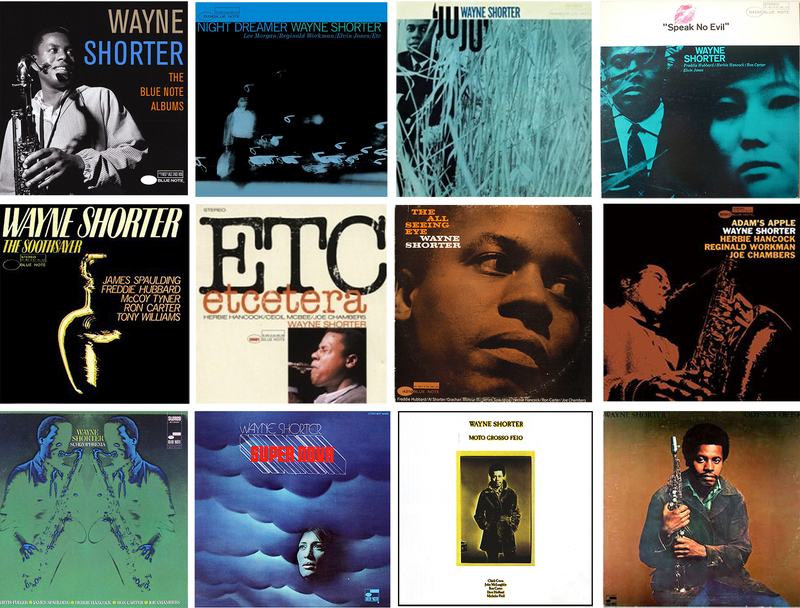 Best Shorter albums on Blue Note? Choose up to four, poll closes in one week. Check back and see who are the favorites. Anyone who’s seen any octogenarian Shorter concerts recently, I’m sure readers will be interested in your observations. Van Gelder, later Liberty Records as part of Transamerica Corporation, issued around 1969 (cover bears copyright © MCMLXIX). Label colour is later off-white, and ® is malformed, printing farmed out, all a signature of its late Liberty issue. Capitol Records Blue Note Connoisseur series reissue of BST 84297 170gm vinyl weight. Liner Notes say mastering by Larry Walsh, run out says Mastered by Capitol – Wally (Trautgott) Make your mind up! Either or both of them. Left, one of the very first Blue Notes I bought, a promo copy on Liberty, long before I knew anything about the mechanics of review copies and pressing quality. It looked clean, but disappointingly, had more “pops” than a kid’s breakfast cereal, and as a result was hard to enjoy. The RCM made little improvement, but recently I hit on a primitive cleaning “technique” effective at reducing some vinyl pops. Right, Blue Note Connoisseur edition, which mimics the original release – apart from the Transamerica logo. I bought the inexpensive Connoisseur to get around the problem of surface pops on the original, but I have to say its sonic performance leaves the Liberty original as my preference, especially since the enhanced pre-wash method sorted out most of its “popping” issues. Obsessive Compulsive Cleaning Disorder sufferers, go wash your hands – twice to be sure, and then read on. Isolated pops are particularly annoying when the record looks otherwise in excellent condition, but plays with random intrusive pops, the sound when the sensitive stylus hits a tiny but immovable obstruction. These are not scratches, but trapped specks of grit gripped or welded in the grooves, probably a result of environmental storage and handling practices decades ago. 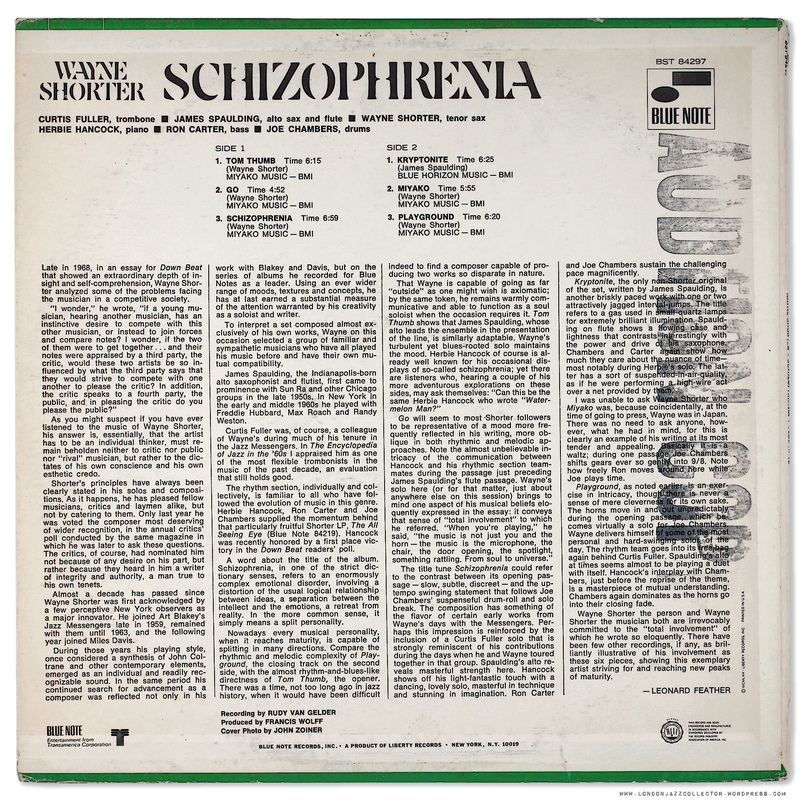 Most vinyl will exhibit occasional pops, but some records have a more troublesome problem, and my audition copy of Schizophrenia was one of them. Tip: forget the golden rule “never touch the grooves”. Hold a record directly under an anglepoise lamp and tilt in the light Amongst the inevitable household dust, there may be some larger particles, seen as small white specks (and others you can’t see) which are “grit” wedged in the grooves. Brush gently with three dry fingers in the direction of the grooves, turning the record slowly full circle in the other hand. Tease any specks of grit, along with any dust, off the side of the record. Any specks that refuse to shift, apply firmer finger pressure to lift it away, and last resort, push a fingernail. Two or three times around the record until you find no more, then repeat on the other side. Then go straight into record cleaning machine mode, wash and vacuum. You may be surprised how much “grit” you will feel, that you can’t see. I encountered fifteen to twenty non-dust “specks” on each side of Schizophrenia, despite it having previously had three RCM washes which failed to eliminate the popping problem. Several records troubled by excessive pops have been rescued from oblivion by this DIY method. It doesn’t eliminate every thing, but it has improved the listening experience without the disproportionate cost of an ultrasonic cleaning machine, which is probably the long term solution. As a result of enhanced cleaning, I have a choice of two copies of Schizophrenia. I’m ok with that, on alternate days. 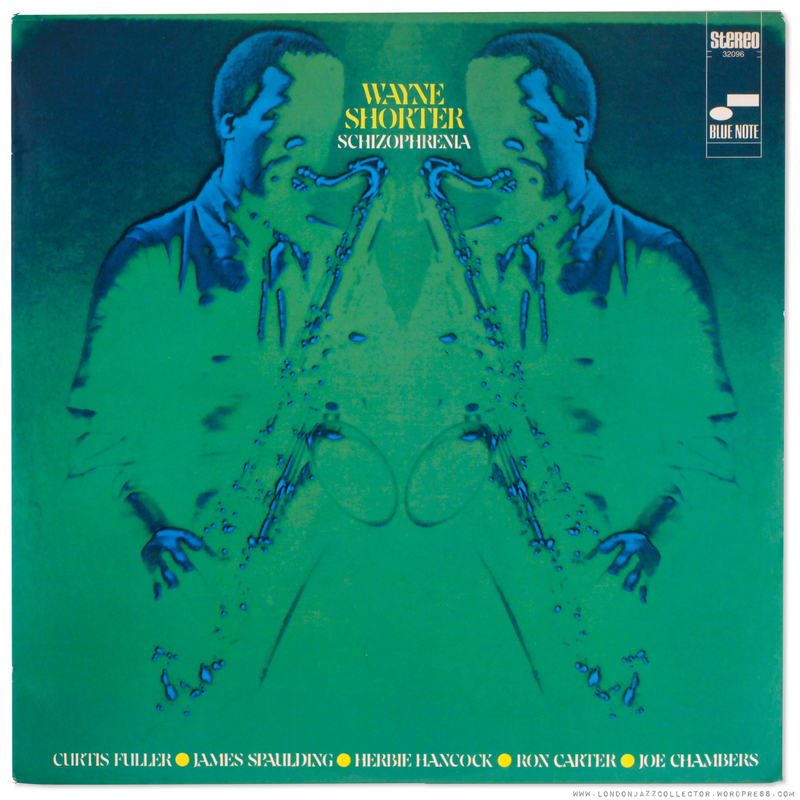 This entry was posted in Blue Note, Wayne Shorter and tagged Blue Note Connoisseur, Curtis Fuller, Herbie Hancock, James Spaulding, Joe Chambers, Liberty, Ron Carter, Schizophrenia The Musical, Wayne Shorter by LondonJazzCollector. Bookmark the permalink. 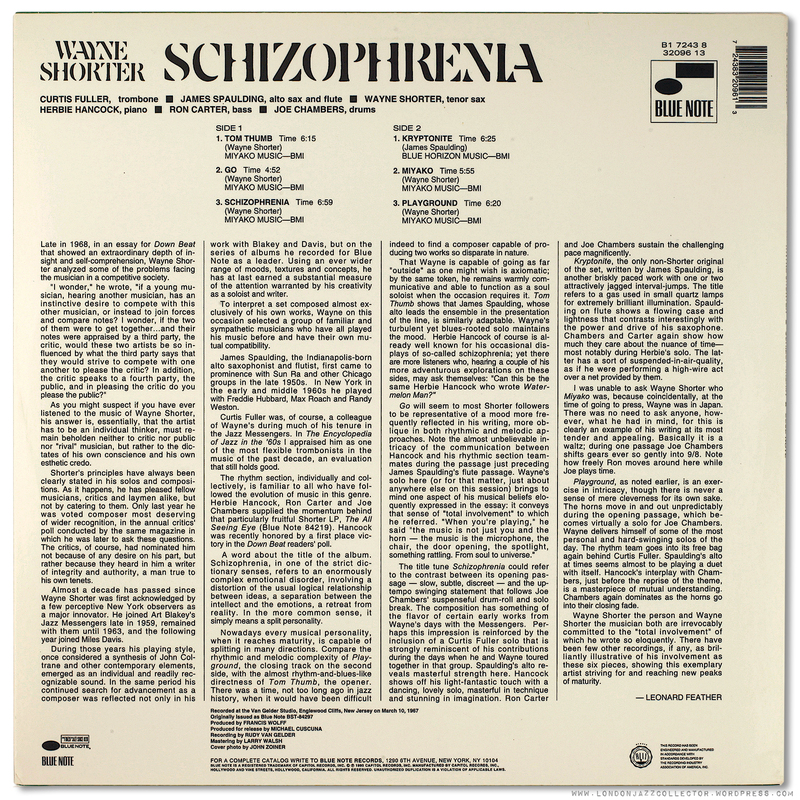 My copy of Schizophrenia is labelled BLC 84297 on the labels and sleeve front, there is a ‘artone press’ logo in the bottom right corner on the back sleeve. There are no dates (listed as a 1969 release on Discogs) – do I have a legit copy? Could you post me some photos of labels and back cover? what sort of stamps and etchings in the runout? There are signs of authenticity, such as fonts, that can not easily be “described” but become quickly evident on sight. 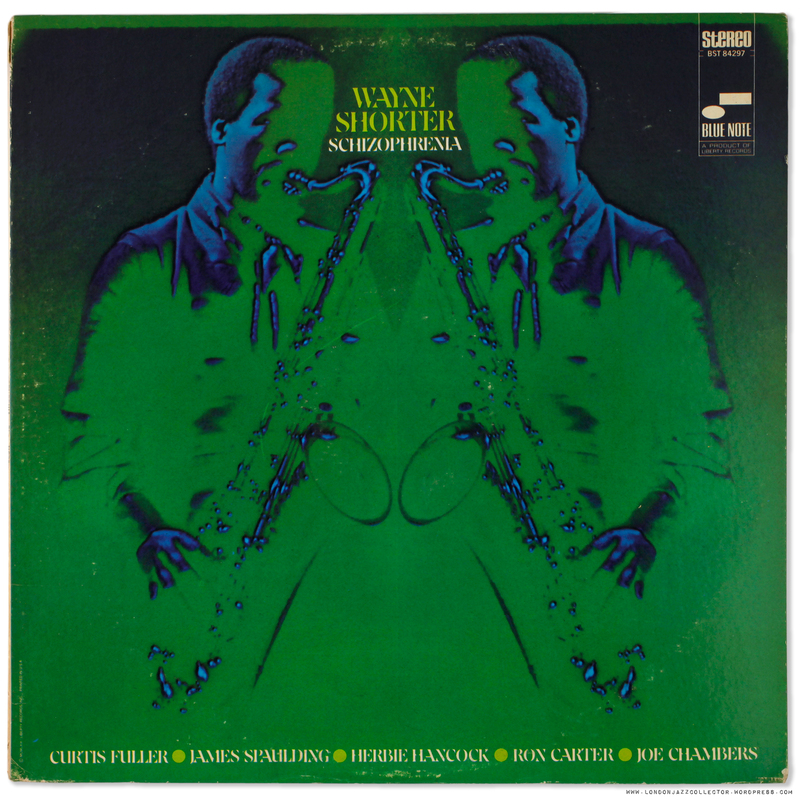 Wayne is my favourite jazz composer and also one of my favourite sax players. And he still amazing at 82. I have seen him live on many occasions and there is true telepathy between the quartet. Highly recommended. The Barbican show in November was incredible. I love so many of his records, especially the Miles and separate BN recordings. Of that period it is ESP and Night Dreamer. Of his later work, I absolutely love Native Dancer with Milton Nascimento and Airto. The interplay between Wayne and Nascimento’s high pitched voice is superb. One of the few ‘Brazilian and Jazz Fusion’ records that really works and doesnt become a cliche. I have Liberty and King pressings and the latter is sonically nice as Liberty. I love this title partly because of the contribution of James Spaulding. Aside from the Blue Notes, my favorite WS record is “Second Genesis,” his second Vee Jay recording released later in the 70’s. I was always of the contrarian opinion that the second Miles Davis “great quintet” was overrated, and having wrongly blamed the sidemen instead of Miles I didn’t learn to appreciate their magnificent solo Blue Notes of the same era until the mid aughts when I was looking for new listening. “All Seeing Eye” is definitely my favorite of Shorter’s and maybe my favorite release out of all of that quintet’s solo work. The sonic difference between the two is not exactly surprising. The vintage pressing has that rolled-off treble, more compressed, and midrange bump associated with mastering styles of the time. The Connoisseur pressing has a more relaxed, less dense sound, with more treble extension, but at the same time not nearly as much midrange magic and “mojo”. Wally Traugott is one of the greatest mastering engineers and I must assume that his cut sounds closer to the master tape, yet it’s not surprising that most will prefer the Van Gelder cut. The Larry Walsh credit was copied off the CD and nobody paid attention. Shockingly, not only do I not have this, i have never heard it, never investigated it — I didn’t even realise it was a sextet recording and I especially like WS in larger line-ups. 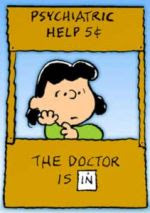 Must remedy. As regards embedded grit, the technical name for this is UG — unidentifiable grolly. A finger and/or finger nail works well but my personal method is a wad of the softest toilet paper you can find plus a squirt of lighter fluid. Leave for a flew minutes; stroke away in the direction of the groove. Seems to shift everything. Hard to narrow it down to four Shorters but I can name the absolute favorite: Juju, to me the pinacle of Shorters carreer. The first two songs especially are easily his finest recordings. I don’t think he ever again chanelled as much fire and brimstone in his playing as on the title track, truly awe-inspiring, menacing hard blowing at least equal to Trane at his best and maybe better. And then there’s Deluge with that wonderful descending melody line, flooding ever down, down, egged along by Tyners tumbling piano figures … hypnotic, a transcendant moment. Another favorite Shorter record isn’t on the poll because it’s actually not a Shorter but a Miles: Nefertiti. Shorters gets the bulk of the writing credits on it and gets in some of his most sophisticated compositions, including the funereal Fall, ghostly melodic snippets fluttering over a subtly dissonant backdrop like whisps of smoke curling through the trees on a moon-lit night. Another transcendant moment on par with Deluge. Glad you mentioned Nefertiti – one of my all time favorites. While I have a handful of Wayne’s Blue Notes and thoroughly enjoy them (Speak No Evil in particular), it’s his work with Miles that catches my attention. Compositions such as Fall are magical. Great to see others appreciate Schizophrenia as much as I always have. I was absolutely blown away the first time I heard it. I have the 1969 Liberty Records release. Schizophrenia is one of my favorite Shorter releases, along with The All Seeing Eye, Adams Apple, and Soothsayer. Speak No Evil and Adam’s Apple are essentials in my book. SNE might land in my top 5 all time and there are days I like Adam’s Apple more. I think the definitive version of “Footprints” is on that record. After that, Juju and Night Dreamer are both absolute classics. In the 60s, I think it can be argued no one was writing better charts than Shorter. The stuff he wrote for the Jazz Messengers, Miles and himself. It’s absolutely astounding, the run he went on. I don’t have a copy of Schizophrenia – appreciate, as always, the sample. It sounds great. I have to go looking now. Thanks for the great content, and the escape from work for a bit. Chose only 4??? For Wayne, impossible! This post is quite timely for me as I’m in the middle of a private Wayne Shorter Blue Note festival. Every Shorter BN record is special and unique to me. I listened to his last 3 back to back ( super nova, odyssey, motto) and was plucked out of time into an improvisational stereo playground universe then came back home to the often overlooked Etcetera, a beautiful swinging and searching quartet with Joe Chambers playing wonderfully, as always. All great stuff, so hard to choose. Etcetera is one of my favourites, too. A really great session left for whatever reasons on the shelf at the time. I guess it would be much better known if it had been released shoulder to shoulder with the other classics. Or at least had been done with a decent cover later on. The cover of the Blue Note release from the 80ies would fit some post-punk act from Manchester of that time. While the Blue Note Connoisseur Series from 1995 tries to look like classic Reid Miles but falls short. The Japanese edition released with a different title (“The Collector”) is a bit sloppy, too. But then it is hard to measure up to the timeless classiness of the great Reid Miles designs. At least we got the music and it is just beautiful! As always, thanks for the great review that will make me re-listen to Schizophrenia tonight. First, I don’t actually own many Shorter-led LPs. That’s an odd gap in my collection, though I have plenty where he appears as a sideman. So my voting in the poll will be delayed this time around. Second, I’m actually really disappointed/surprised to learn that Without A Net hasn’t had a vinyl release. It’s a highly praised recording so deserves release on the best possible medium. Third, you asked about people who’d witnessed “octogenarian Shorter concerts”. I saw him live twice last year at The Barbican. First in February with Wynton Marsalis and the Lincoln Center (sic) band. This was really a retrospective going back through notable highlights of Shorter’s career. Overall a really enjoyable night with Shorter playing well but the pleasure was somewhat diluted by him sharing the limelight with the rest of a quite large band. The second occasion was in November with Shorter’s current long-standing quartet (plus some additional guests from Poland for the final segment). It took a tune and a bit for the band, sound engineers and audience to warm up but from that point on it was electrifying. This quartet is one of the must-see jazz groups in current existence. A highly talented band, each leaders in their own right and Shorter shows no sign of dodging challenging music in his old age. I was especially taken with drummer Brian Blade who I’m starting to see as the heir to the Alan Dawson-Tony Williams lineage. He’ll be back in the UK with Chick Corea at the Cheltenham Jazz Festival later this year, so consider your card marked. Fourthly, your section about lo-fi manual record cleaning did give me the heebie-jeebies. I’m not sure I could bring myself to do what you described. Last Autumn I got the opportunity to play with one of the Audio Desk ultrasonic record cleaners at my friendly local hifi dealer. I was very impressed with the results and I reckon this type of cleaning could handle the debris you’ve been removing manually. What didn’t impress me was the price of these machines – they cost thousands. However, since Christmas I’ve come across several semi-DIY options where you can buy an ultrasonic cleaning tank very cheaply and attach a motor and spindle to the top that rotates records through the bath to clean them. The pricing is much more realistic, so it’s something I may consider later this year. If any of you are interested (or have experience to share of this system), take a look at http://cleanervinyl.weebly.com/ and see what you think. This isn’t a recommendation – just a sharing of information – because I have no direct experience of this particular set-up. Finally, a big “plus one” from me for Adam’s comments above about Joe Chambers and James Spalding. I especially like Joe Chambers as a drummer and, indeed, particularly his recordings with Bobby Hutcherson. I have this record cleaning combo, just picked it up after Christmas and it makes a difference. I am still trying to figure out the best cleaning solution/number of records to clean at one time/followup rinse on VPI machine to make it the most effective option. I have used the neanderthal cleaning technique that LJC suggests at times to get a particularly stubborn piece of grime from my grooves. I just figured that it was not coming out with normal cleaning so I had nothing to lose and a bothersome noise or skip to get rid of. That’s some very interesting information Martin and Jerry, thanks for sharing. I’m finding myself seriously considering giving this combo a try in the near future, especially since the combined price comes in a few hundred bucks south of a VPI or similar dedicated record cleaner, which I’ve wanted to purchase for a while but find myself putting off due to the investment. Think a makeshift ultrasonic cleaner would make a good replacement for a VPI? If anyone can share more information or experiences I’d be most grateful. Does anyone have the Japanese King LP on this? Sonics? Martin, I also had the opportunity to use an ultrasonic cleaner at a local hi-fi shop. In two days I cleaned approx 100 records. In general, results were fantastic. Given the volume of cleaning solution to mix and the time involved, it seems most suited for “batch mode” cleaning when you have a large block of time available. As several manufacturers have mentioned, the dirt removed from records becomes suspended in the cleaning solution and must be continually filtered out (some provide an aquarium filter for this purppose) or it will become deposited on other records, That was indeed my experience. Joe Chambers and James Spaulding often fly under the radar which is understandable when you contemplate the immense riches that constituted the Blue Note roster at the time, but they figured on many key releases, Spaulding with Sun Ra and at least a dozen essential Blue Notes, and particularly Chambers whose contributions to several classic Bobby Hutcherson sides, especially ‘Patterns’, surely earn him at least a second-tier place among the legends. I will have to revisit ‘Schizophrenia’ on the strength of this review. It never achieved high-rotation for me but that’s probably because I was Shortered out listening to ‘Night Dreamer’ and ‘The Soothsayer’ so many hundred times. Egads, where does one begin? Hmmm Pretty Great. Esp. Spaulding’s & Chambers’ contributions [previously noted above].